Day two has proven to be a different beast altogether. I got some good tips last night in conversation with some other campers and started bright and early to try and fold away the tent before the rain started. I only just managed, and i was on my way. 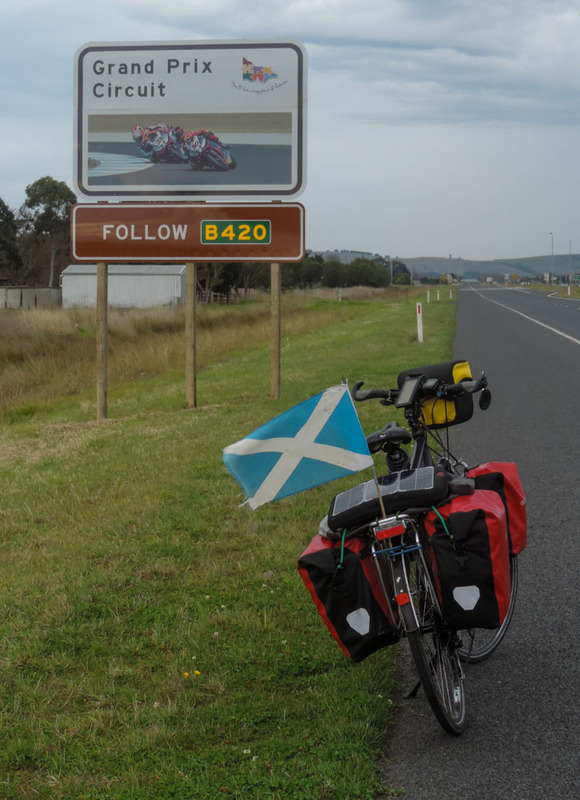 Since I knew I was coming this way down the coast I had been toying with the idea of detouring to Philip Island, home of the MotoGP as well as of a big penguin colony. In the end the road sign is all I got to see and I suspect, given the season, I did not miss much. Not raining yet, but the sky is not looking good. Not sure I’d qualify on this. The rain did not let me wait to long and round about 10:00 I was already well drenched and in need for a V energy pit stop. I got that in Bass which was also the crossroad for the deviation that Google recommended. I was pleased to start with, as the detour got me out of the motorway (note that the term motorway outside the cities only indicates dual carriageway and it is a fine road to cycle onto). The detour started ok, even though it was unsealed, but then, when it was to late to turn back, it turned into a full on country path, lovely indeed on a sunny day, but less than ideal in the monsoon season. Luckily it’s cold and the snakes are hibernating. Not the first time I regretted following Google Maps advise. And this sign was just what the doctor ordered, especially the last bit at the bottom. 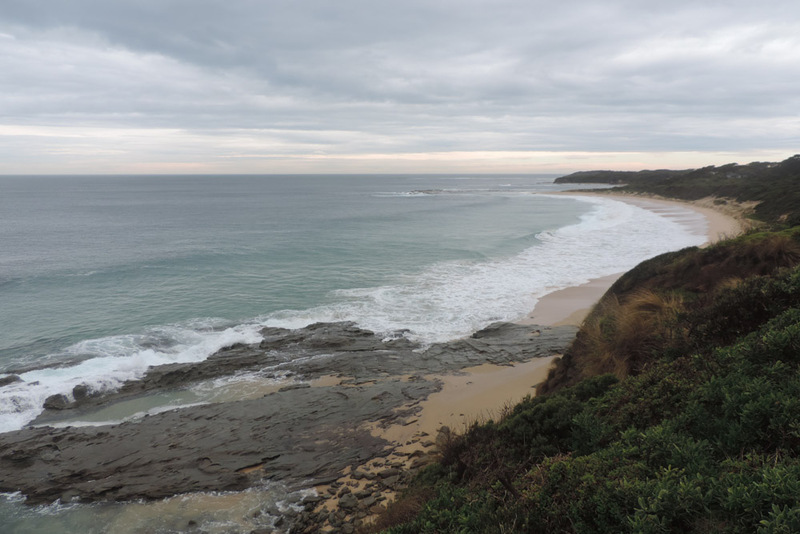 The goal for the day was a bit more than 60 miles and a place called Walkerville not to far from Cape Liptrap, but, after two long pauses to avoid the worst of the rain, it become apparent that that objective had to be revisited. The first stop I made was near Anderson. I took shelter in a bus stop and contemplated the possibility of hopping on a bus for a few miles just to get milage even in the rain. In the end I did not and that was for two reasons. I don’t need to hurry is the main one but, even if I had wanted, it is not possible to carry bicycles on busses in Australia unless they are foldable. This already vindicates my choice to move to a foldable bike as my next touring bike. This kept me company at the bus stop. 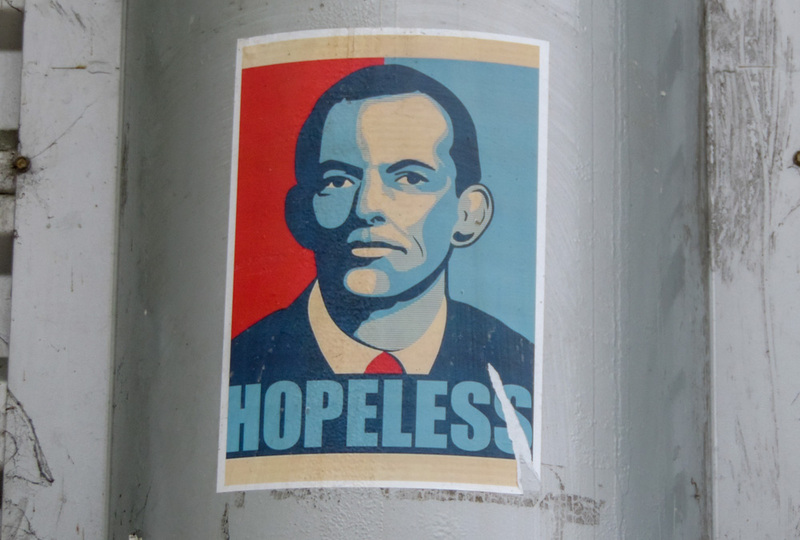 Not sure but might just be something to do with the name Tony and being in politics. 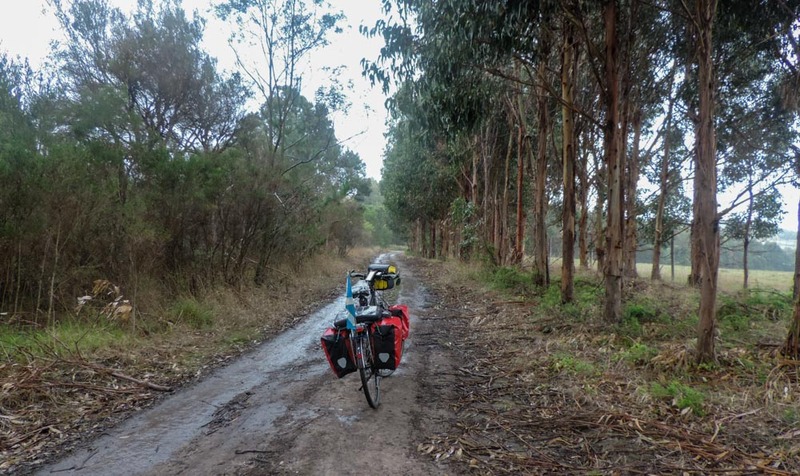 As the rain appeared to diminish I decided to put some miles in, but it was not going to be long before I stopped again. This time in the Kilcunda General Store, a lovely caffe where I sat reading for nearly two hours and had a superb soup. 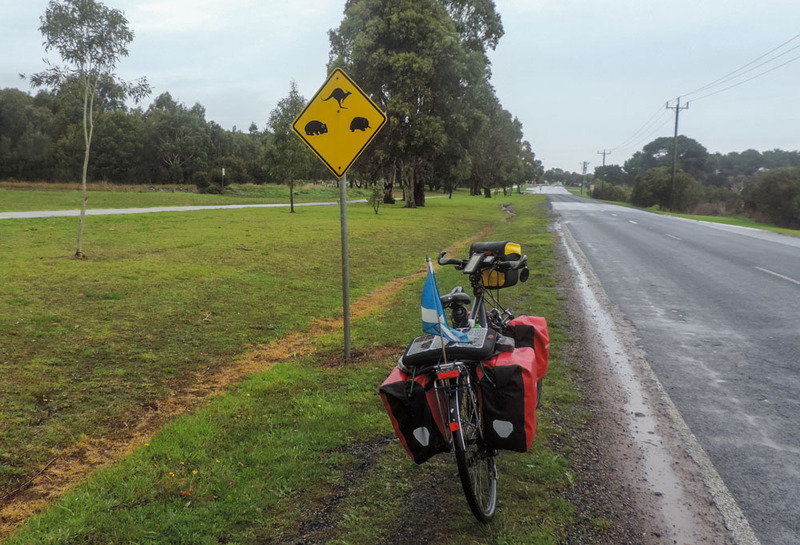 It was now getting toward 13:30 and the rain was not as bad anymore so I decided to press on having all but decided to stop in Inverloch for the night, but also to add the guilt busting Cape Patterson detour. First sight of the Ocean, albeit through quite some rain. 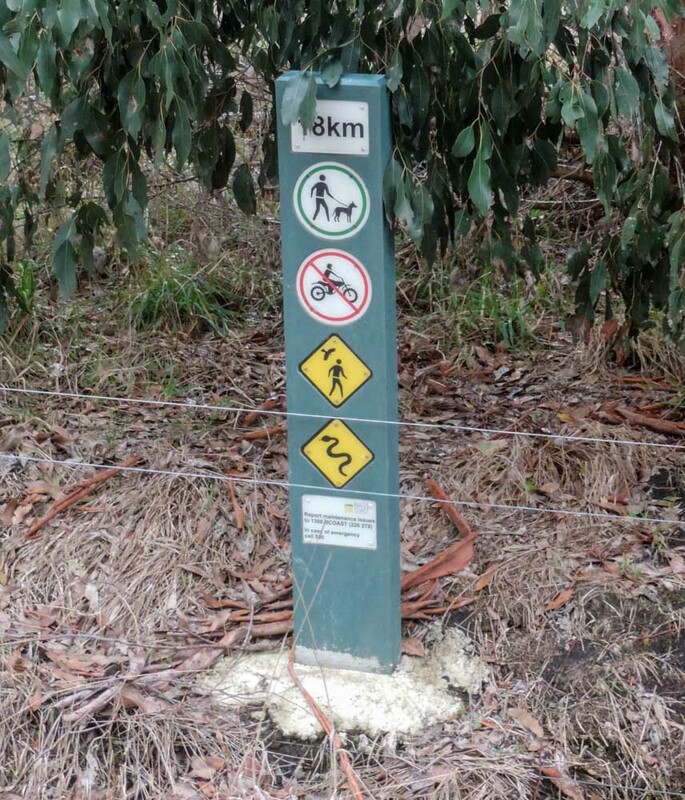 It took me 50+ kiwi signs in NZ before I saw a kiwi, let see how many of these I pass before seeing a kangaroo. 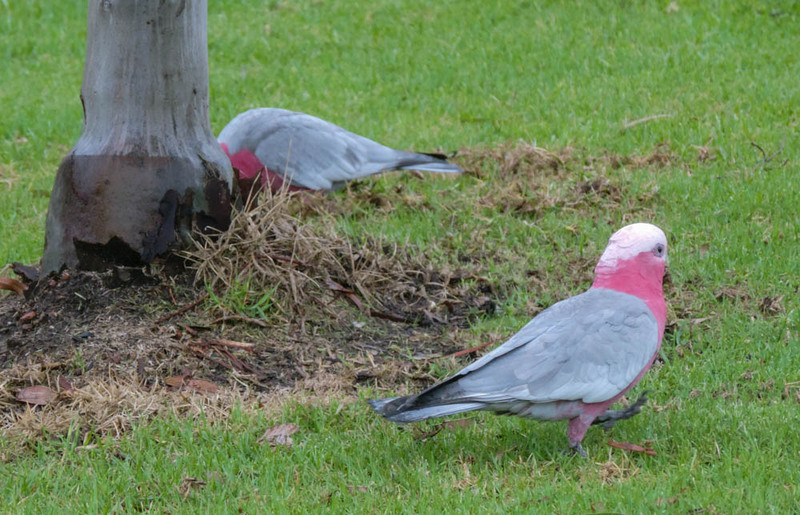 Bird variety is much easier to spot. 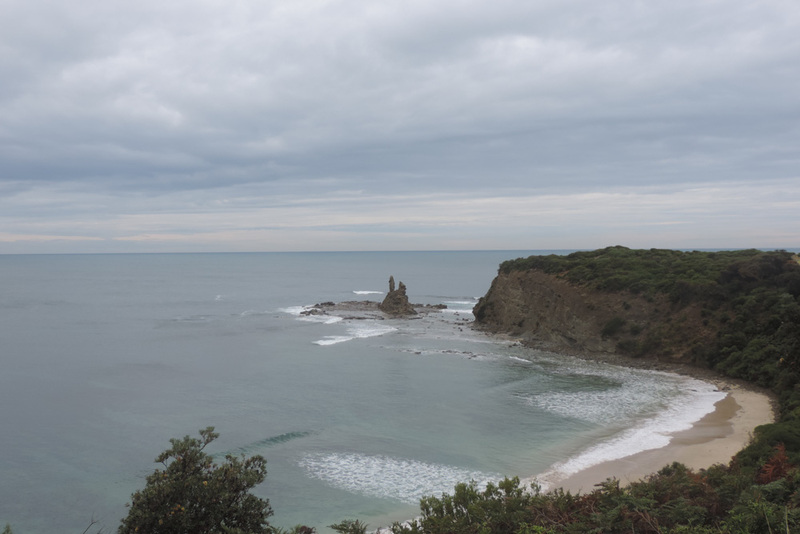 Cape Patterson itself was a bit of a nothing place, probably it would have shone in better weather and also if I’d been riding a surf board rather than a bike. 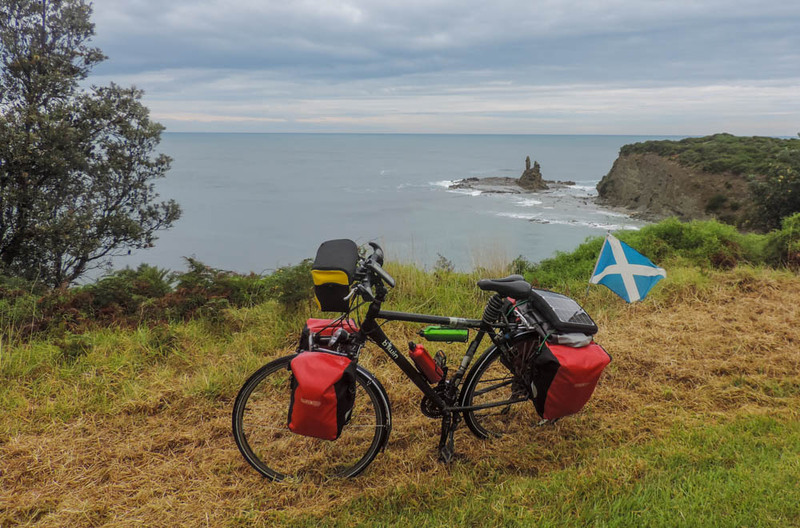 The road between the Cape and Inverloch on the other hand was splendid and it gave me hope that I will get as good a show on the way to Sydney as I got on the long costal rides in New Zealand. The scenery is improving, and the rain diminishing. So there is some wow on this side of the Tasman sea too. The cliffs appear all to be very brittle and I did not dare going to far out for fear of finding myself at the bottom in a rather uninhabited part of the country. What was remarkable though was that the scenery almost gained in dramatic value due to the rather bleak weather. Still a bit wetter than I’d like but great scenery. All in all I got out of a rather wet day in a reasonably dry condition. While I had feared for a while I would not be able to camp I have successfully pitched for the night in the Inverloch BIG 4 campsite. I guess going BIG 4 is the only concession I am making to myself. The BIG 4 chain is the sister chain of the TOP 10 in New Zealand and they are a bit posher but a bit more expensive. The good news though is I was able to get a discount with my TOP 10 membership card. So, tomorrow it looks like it’s going to be mostly dry but for now, for all the kids of the 80s, I’ll leave you with a rainy classic. Those clothes make me glad we left the eighties behind. Watch out for those snakes.